Magnum Tonic™ offers the very best value for a natural testosterone support supplement. Using only the most advanced, innovative Pharmaceutical Grade ingredients, Magnum Tonic™ will increase your free-flowing testosterone in a matter of days. Why take a testosterone booster? Testosterone boosters are created for men looking to improve and support their natural testosterone production. These products are best used to enhance lean muscle mass, repair and support test. production damaged by the use of pro-hormones or steroids, and increase the amount of free-flowing testosterone and your body’s ability to recognize more of what is already there. How quickly can I expect results from Magnum Tonic™? You should start to see noticeable results in your first week; however, we have had many customers & athletes notice a difference in their hardness and strength in the first few days! What results can I expect from taking Magnum Tonic™? Results include strength gains, endurance, muscle hardening and a difference in your recovery between workouts. Why is it not recommended for women to take Magnum Tonic™? As Magnum Tonic™ effects testosterone levels, unless a woman is trying to increase her testosterone (by suggestion of her physician), it should be avoided by females. 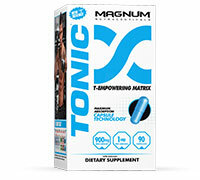 Magnum Tonic™ claims to be a true “testosterone booster,” will I test positive for anything questionable? **If you compete in a strict federation, it is best to check the ingredients of Magnum Tonic™ with the governing body of your sport.